The mythical 36er bike has been on my mind for quite a while. When the frame of a bike is the right size it for a tall guy it makes even a 29er mountain bike tire look a little small. When I noticed the 36er built by Black Sheep bikes it got me thinking about a true clydesdale size bike for a big rider. In the back of my head I’ve been thinking it would be fun to try a 36er but I couldn’t justify buying a turn key custom Black Sheep bike. Not that I wouldn’t have them build me a frame, I might just choose a 29er hardtail dialed into my exacting requirements that I would lovingly ride for years to come. The 36er is still a very experimental platform. That is what makes it so cool and a 36er Klydesdale from Choice Collective is the perfect testbed. Choice Collective did a custom run of 200 Klydesdale Cruzer bikes which are priced very well at $799. That is a good price considering the small market segment and this type of build quality. 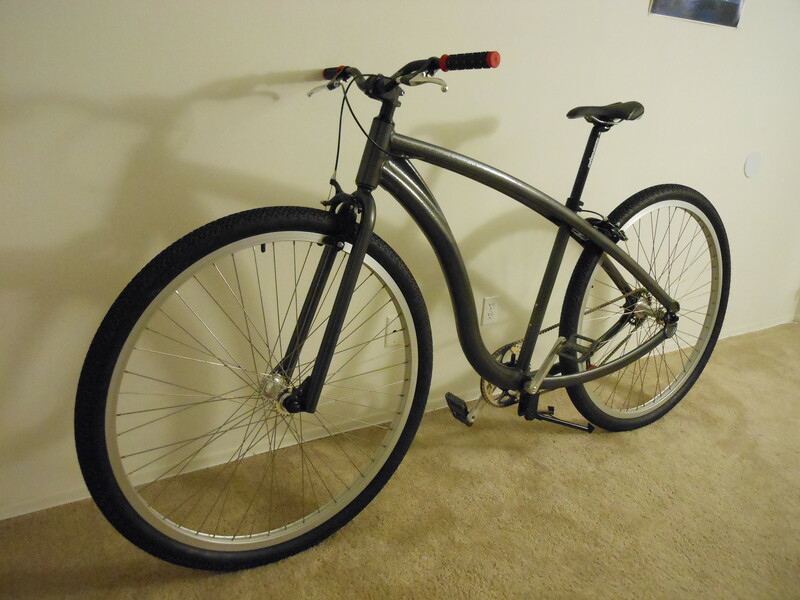 My personal bike is pictured below. I’ve made a few modifications to the original setup to facilitate my style of riding. I wanted straight bars and a seat which would remind me of my other bikes. The standard out of the box build comes with big ape-hanger handlebars and a large plush seat. I saved a few pounds and got controls I’m accustomed to riding in the switch. The pictures don’t do it justice, this is one big bike. However, it rides very well and I’m quite happy with the overall performance. I took it for a 28 mile round trip to work and it turns heads. A friend of mine at work, who is also tall and rides, loved the idea. Everybody else couldn’t help but notice it parked in the hallway next to the regular, pony sized bikes. This is one sweet ride. 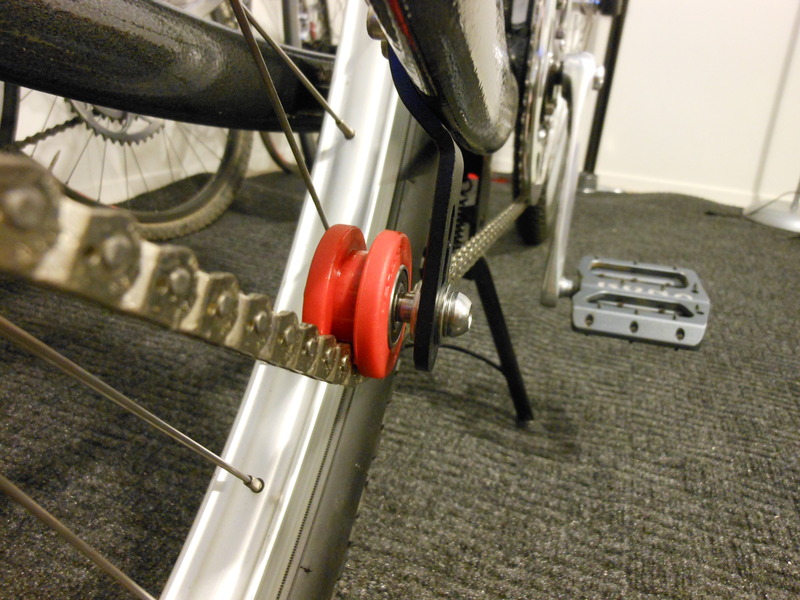 One small modification I would recommend is to replace the plastic chain tensioner jockey wheel which comes with the bike in the stock configuration. It is a quick and cheap fix that goes a long way. The stock wheel does not have a bearing and it makes a quite a squeaky noise as it spins. 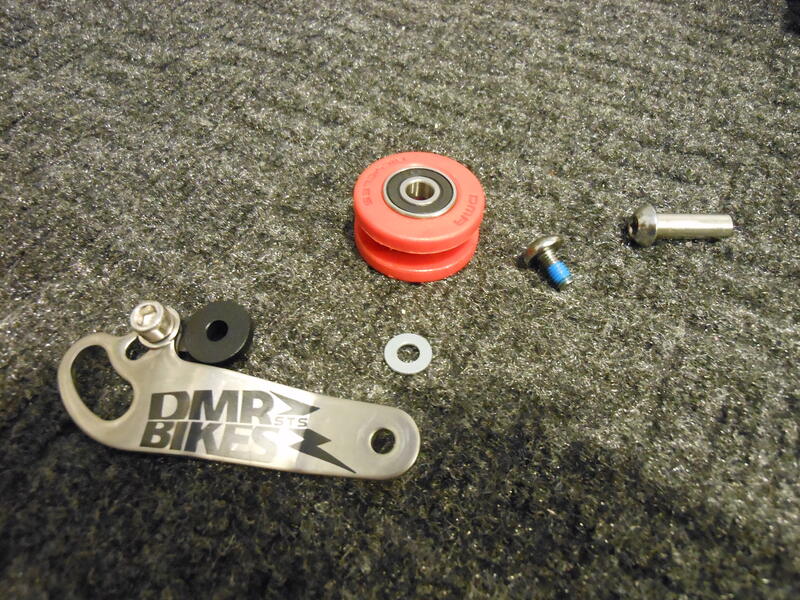 I used the jockey wheel from a DMR single speed conversion kit for a vertical dropout bike. 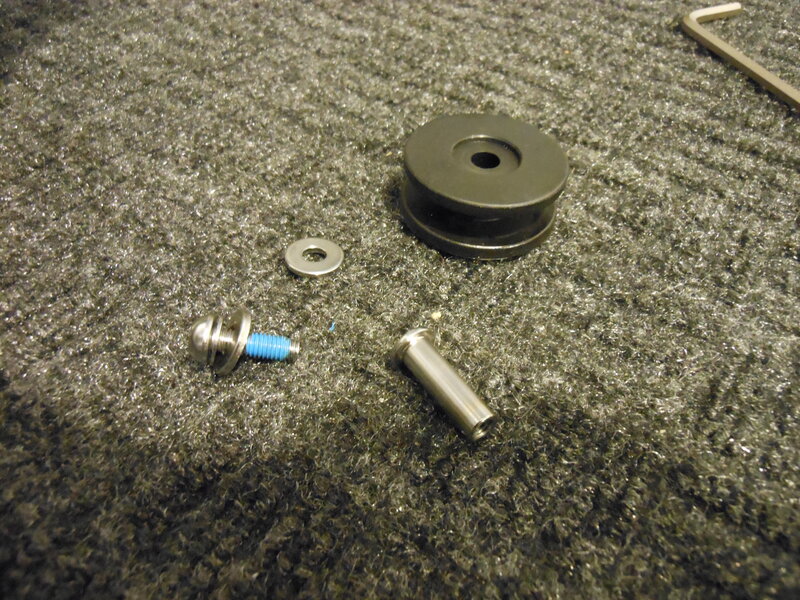 It turns out the DMR part has a bearing with the correct inside diameter to be used on the Klydesdale 36er. The parts and swap are shown below. I used the red/orange colored jockey wheel from the DMR conversion kit along with the shaft/nut. I used the bolt and washers from the Klydesdale. The DMR kit and the Klydesdale have functionally equivalent shaft/nuts that the jockey wheel rides on. 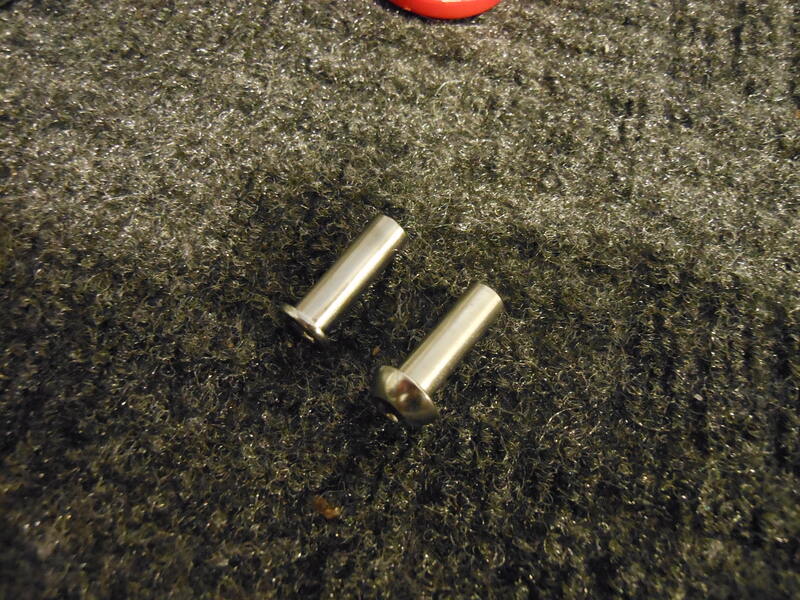 They are the same length, diameter, and internal thread size. This picture shows the final installation. The tab sticking down from the frame is sandwiched by two washers. The steel shaft/nut does not go through the inside washer. After putting some good miles on this setup I’ve noticed the new jockey wheel likes to sit right up on the washer next to the tab. Some of the time it walks over while the bearing it rides on stays put on the left side at the head of the nut/shaft. I’m planning to add a couple washers to the left side of the jockey wheel to keep it closer to the tab where it naturally sits during a ride. Overall I’m very happy with the 36er and plan to keep riding it as one of my three primary bikes. 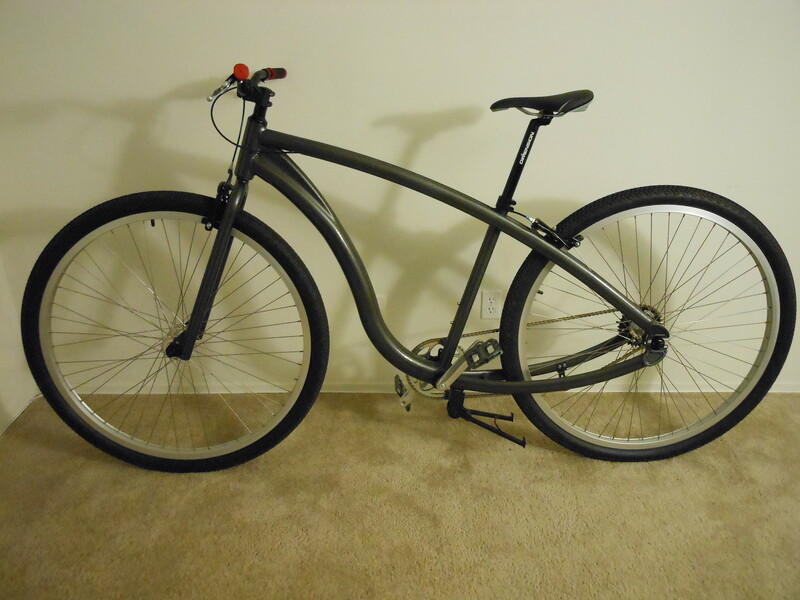 It is going to make a great summer bike for short rides around town and up the beach bike path. I’m also planning to start researching lighter wheels and tires. The current setup works fine but I’m curious to know what is out on the market. This bike is a great platform to start experimenting with 36er technology.